South Africa has throughout the twentieth century produced many excellent and celebrated composers. This trend appears to be continuing into the twenty-first century, with Robert Fokkens a skilful representative of this new generation of composers of international significance. Fokkens was educated in South Africa and the UK where has chosen to make his home. He acknowledges the debt of inspiration he owes to South Africa for his unique musical language which also benefits from other distinctly recognisable global trends, not least minimalism. His voice is in any event a mature and distinctive one, which deserves to be more widely heard. This CD, entitled Tracing Lines is an anthology of chamber works for smaller forces, ranging from the Nine Solitudes for solo piano, to Mammals of Southern Africa for piano trio, which along with Inyoka Etshanini, scored for bass flute, violin and cello, employs the largest forces. The compositions presented here are structurally compact, technically assured, with firm intellectual underpinning and possess a compelling communicative power. Members of the Fidelio Piano Trio provide the backbone to this excellent disc, and are joined by the soprano Patricia Rozario and the bass flute of Carla Rees; all of whom contribute committed performances throughout. Tracing Lines, a duo for violin and cello, sets the tone for an expressive and evocative musical journey of over an hour’s duration. Violinist Darragh Morgan and cellist Robin Michael are quickly into their stride, confidently revealing the essence of this evocative composition with its hints of Xhosa bow music. Inyoka Etshanini is a tender but effective confrontation between chordal string harmonics and the eloquent bass flute of Carla Rees, which leaves one yearning for more. Mammals of Southern Africa provides the most obvious connection to the composer’s South African roots. Each of the five character pieces encapsulates a nuanced understanding of the African continent, the complexity of life that inhabits it, and the unsullied connection it maintains with nature. The Nine Solitudes for solo piano, written for the South African pianist Jill Richards, are given a persuasive and convincing performance here, by the Fidelio Trio’s pianist, Mary Dullea. On Disruption and Displacement and Irreconcilable Truths for cello and piano, and violin and piano respectively, centre on the concept of conflict. The performances successfully maintain a persuasive and wholly appropriate breathless vibrancy throughout. Africa, for soprano and piano that concludes the disc, is a setting to music of the touching and perceptive poem of the same name, by the poet David Diop. Patricia Rozario sings Fokkens’ setting exquisitely and one is left thinking not just about the music, but also about what the future might hold for Africa, the second largest continent. Whilst this disc is immensely enjoyable and thought-provoking to listen to, all of the pieces here are in essence miniatures. 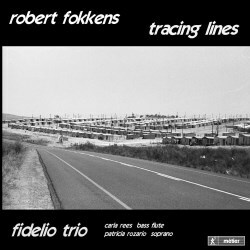 I look forward to hearing recordings of larger scale compositions from Robert Fokkens.